"Mug" is a ceramic mug with a man's face in it. I was inspired by some mugs I saw at a pottery store that had a similar design. Originally I was going to make a hand holding a d20 but it proved itself to be too difficult for my first real attempt at sculpting. The change of projects in the middle of the process was also a little bit difficult, but it was easier than the original plan. Aside from the inspiration that I found in a pottery store, I found inspiration in a video on youtube about how to hand sculpt a mug. As I've previously mentioned this is my first serious attempt at ceramics therefore I learned a new medium and had to work the challenges that come along with that. After the first day I learned to use some of the sculpting tools and learned a little about how clay acts and it was smooth sailing from there. I like how this project turned out and I will be giving it to my sister as a Christmas present. My piece "Sticks and Stones" is work done entirely with things found outside. Although a lot of earthworks use only natural things, I specifically used man made things that were placed in nature. The wood pieces are not sticks or parts straight from a tree, they were from 2x4s at Lowes that are made from trees that were cut down somewhere else, processed at another place, and sold. I chose those pieces of wood because they represent the idea behind my work. The idea behind it is that nature is gone in most of the world and we need to find beauty in what we have, even if what we have isn't natural. I like this piece not because of how it looks but because of what it means to me and many others living in the world today who can walk two feet without seeing a construction site for a new apartment building. My piece "Monster" is a styrofoam and glue sculpture that also has some light pen detailing. It is the result of cutting up three styrofoam cups and gluing them together is different ways. This was not my original plan. The pen detailing I mentioned is from a previous draft of the project when I want the sculpture to have multiple sets of teeth drawn in pen the could be displayed by turning the cups around. This taught me the importance of sketching and planning. My goal for all of my artwork is to be satisfied with the end result and although it's not what I originally wanted, I am satisfied with how it looks. Because this is a collaborative piece I can't take all the credit but one thing is for sure the original selection came from my art piece mixed with a selection from one of my group members. This conglomeration of our works and the color scheme we decided on is the main inspiration for the piece. We then developed the idea further by deciding where the different colors should be placed. The three artistic behaviors that I think were present in this project are developed skills, solved problems, and communicated through the work. Personally I developed my gradation skills, as a group we solved the problem of how to work as a group and I think although we are three different people we all got a unanimous message through the piece. Artist Statement - Noah G.S. When I took the initial pictures I knew only a little bit about composition. I thought about what would look good but I didn't know the rules. When we learned about composition in class, I understood what needed to be done. The original photos show common mistakes in composition. The new ones aren't perfect but I kept the composition rules in mind and I hope my photography will improve with practice. 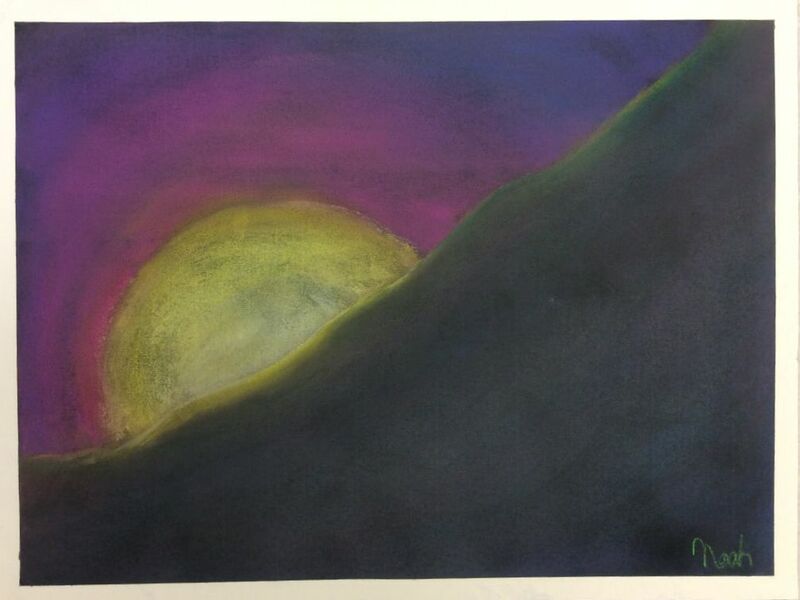 As the title implies "Mountains by Moonlight" is a chalk pastel piece that represents the side of a mountain lit by the moon. It has a blue to purple gradient in the sky that is also reflected in the mountain. Additionally there is yellow moon-glow throughout. The final composition is not what I originally envisioned but it turned out great. Because it is done with chalk pastels it has many layers each one bringing it closer to what it finally became. You may not be able to tell but it was originally oriented portrait style and featured evergreen trees obstructing the moon. My usual goal as an artist is to be satisfied with my work and that is one of my goals for this piece but there is another goal that I achieved. I made two other pastel landscapes before and I enjoyed the medium very much so I wanted to improve my skills. I achieved both goals and am very proud of my work. ​“Creature of the Night” is a multimedia ink splat art piece. 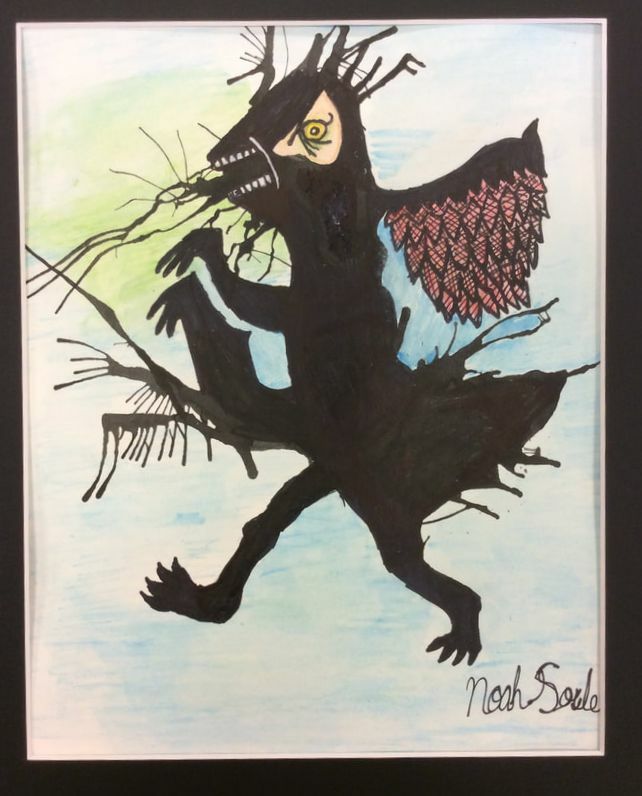 It features a large dark figure, with red wings and yellow eyes, surrounded by a light blue background. It started with an ink splat on my paper. I proceeded to blow the ink around to make a shape that I thought was cool. When it was all done and dry I took a look at it and saw a creature running and puking. This art piece shows the two sides of myself, the light and the dark. Light because it's funny and lighthearted but dark because it's dripping and oozing and slowly dying a painful death. My goal as an artist is to be satisfied with the final piece and I achieved that. I'm Noah Soule, I consider myself an artist. I've been doing art for ten years and get better every day. I'm a student at Vernon Malone College and Career Academy in the SGD program area.